Muttiah Muralitharan is the highest wicket taker in test and ODI cricket. this article gives you complete information about Muttiah Muralitharan. More details about Biography, profile and career performance of Muttiah Muralitharan is quoted in this article. Read this article full for more details. 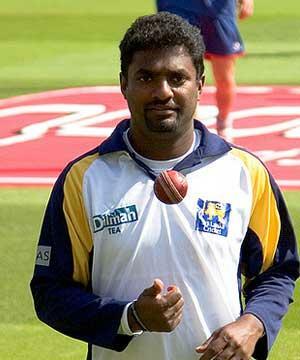 Muttiah Muralitharan is one of the best spinners in the world. Muttiah Muralitharan was born in the year 1972 April 17 at Kandy, Sri Lanka. Muralidharan holds the record of highest wicket taker in test and ODI cricket. Murali was a record breaker in world cricket as he broke Wasim akram's record of 502 wickets and then Shane warne's record of 708 wickets in 2007. Muralidharan made his test debut in the year 1992 August 28 against Australia and his one day debut was against India in the year 1993 August 12. Murali was a right arm off break bowler and a right-handed bats man. Murali was retired from test cricket in 2010 July 18. Murali had taken 800 wickets in test cricket and 534 wickets in one-day cricket. His best bowling performance in ODI cricket is 7 for 30 and 9 for 51 in test cricket. Murali was also playing for IPL team Chennai super kings where he made his IPL debut on April 19 2008 against Kings X1 Punjab. More details about profile and career performance of Srilankan spinning magic Muttiah Muralitharan is given below. Sanath Jayasuriya is a very respectable man in cricket world. A very fine batsman of his time, he is a left hand batsman who can destroy any great bowling attack by his aggressive batting. A all-rounder in ODIs he is capable of playing big innings in both ODIs and Tests. Here is a detailed information about him in this article given below.